You’ve just got your big score with that large elusive buck! You reach into your hunting pack … which sheath do you grab? Hopefully not one with a dull gut hook knife! Getting the deer onto the ground is only the first step. It’s time to start field dressing the game, and you’re on the clock if you want to preserve the meat. For gutting wildlife you want a durable, reliable knife that will provide effortless cuts as you gut. A gut hook is the perfect companion to a skinning knife, and it is what you should be reaching for from your bag. Main reason: It’s going to make your life easier as you begin skinning and gutting. After spending a significant amount of time researching, testing and reviewing gut hook knifes for our own hunting in the past, we found how overwhelming the market was with so many different options. In this buyer’s guide, our goal is to help you wade through your options to find the highest rated, top quality and perfect gut hook knife that fits your gutting and skinning needs. We will be reviewing the top gut hook knives available, as well as providing more information about what a gut hook is, ultimately so that you can make a well-informed purchasing decision! I personally know how exciting it is to want to get back out there in the field, so I hope I can help quicken the process for you! In a rush? Check out our top 5 Gut Hook Knives below, or click here to see the BEST Gut Hook Knife choice! 7.1 What is a Gut Hook Knife? 7.2 Why a Gut Hook Knife? 7.3 Is It For Everyone? Buck Knives has built their brand on producing high quality, durable, American made hunting knives, and this model certainly doesn’t disappoint. The Buck Knives 0691BKG is a prime example of this superb craftsmanship. It’s an easy knife to use, carry, transport and gut with. This gut hook provides a much more seamless cut than a traditional knife offers, and handles field dressing for deer, hogs, elk and most game effortlessly. This knife is hands down, clearly one of the best overall gut hook knife when all elements are considered. The blade quality and sharpness of the Buck Knives 0691BKG Buck Zipper Fixed Blade Knife is impeccable. Out of the box it comes razor sharp fastened with a great gut hook and blade. The gut hook creates effortless, clean cuts past the hide on any game, which is incredibly useful on gutting a deer. This knife holds its edge extremely well, even after skinning and gutting numerous deer. Its durability is tremendous, maintaining a sharp edge for years. For instance, some users have been able to dress 10+ deer without having to sharpen it once. This is absolutely one of the sharpest knives that you will get out of the box ready for field action. This knife was carefully designed with ergonomics and looks in mind. The 0691BKG Buck Zipper has a nice, handsome finish to it. It’s so shiny that it replicates its pictures. It has a sturdy feel to it with good weight and balance distribution. It is the ideal size for any hunter, even if this is your first “zipper” or gut hook knife. It has a wide blade belly that is useful for skinning. The 0691BKG has one of the best handles that we have found on a gut hook knife. With a textured rubber handle, it rests comfortably in your hands with a soft, rubber grip. It has a non-slip grip in all conditions, whether it is dry, wet, greasy or bloody conditions. The handle is efficiently designed to avoid getting overly slick while gutting. It is full tang which means that the knife is one solid piece and the 2 handle pieces are attached to the blade. It extends for the full length of the grip-portion of the handle and allows for increased force leverage with the handle (beneficial when using it against harder materials). The steel is an important feature and make-up of any hunting knife. The reason that this knife comes out of the box so sharp and maintains its edge well is because Buck Knives uses 420HC Steel for this model. This type of steel is rugged and tougher than similar products because it has a greater carbon base than 420 stainless steels. 420HC Steel is known to be an excellent everyday steel, holds an edge well, tough, easier to sharpen, durable and corrosive resistant. If you’re familiar with Buck’s old 440C, the 420HC sharpens much easier. 420HC steel is also beneficial in keeping the cost of knives low (a more affordable steel than other types). All of that to say that while it isn’t the top of the line steel, it’s very good for money and what it offers. While it is corrosive resistant, it is not rust proof. To protect your knife from rusting, it helps to rinse, dry and oil the 0691BKG after usage to clean it. The knife sits snug in the provided nylons sheath which also has a plastic blade guard. It helps to prevent the knife from cutting through. While it is a decent, it is surprising that this knife would not come with a higher-quality sheath. For the money, this is overall one of the best gut hook knives that you can buy. Factoring the high-quality steel, the comfortable handle, razor sharpness of the blade, and the quality gut hook, it’s not hard to see why this is one of Buck Knive’s highest rated knives. The functionality and durability of this knife is astounding. It will be an instant favorite in your knife collection, and one of the best gutting knives that you own. 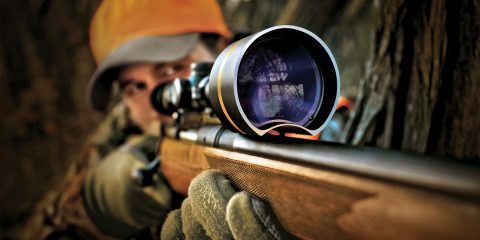 For most hunter’s, it will more than exceed your skinning and gutting needs. You might also find your friends wanting to borrow it in the field. 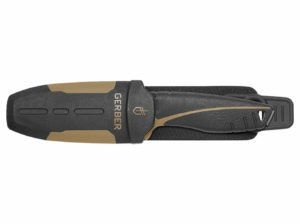 Gerber is another iconic, innovative and well known maker of high quality knives and multi-tools. The difference between some competitors and the The Myth Fixed Blade Pro Gut Hook is that this knife was clearly designed by professional hunters. If you’re looking for a gut hook primarily for gutting deer, you should be strongly considering this knife. This Myth Fixed Blade Pro is the cornerstone and main hunting knife of the new Gerber Myth series. It’s beautifully designed to be slim and lightweight, featuring full tang, high carbon stainless steel with the gut hook tip. 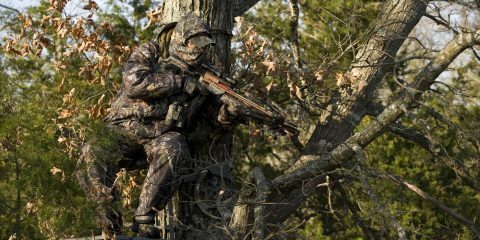 These features allow for quick field dressing of game. As the name suggests, this knife comes as a fixed blade. While folding knives certainly have their place in hunting, when gutting and skinning you generally want a high quality fixed blade. For a high quality deer gutting knife, the most important feature for a hunter is the blade and the gut hook. This knife can handle deer, elk, hogs, turkey, duck, fish and almost any type of big game with ease. We found that while the Myth Fixed Blade Pro out of box knife sharpness and edge leaves more to be desired, it can be made razor sharp after a quick file. Compared to other skinning knives that we have reviewed, the Myth Fixed Blade Pro holds a decent edge and point. It may not win awards for its edge retention, however it still remains sharp enough to slice a finger open. It has a good blade and excellent gut hook, but will require sharpening. The blades are ultimately large enough to cut through hide, but also tact that you’ll be able to fit it into tight places. The first time you pick this knife up, it becomes clear that the handle was designed by hunters who know the importance of a comfortable grip. Of many hunting knives, this has a better handle than most, and feels extremely ergonomic. While the handle could be thicker, it still feels extremely comfy in the hand. It’s important that a gut hook knife has a good grip so that it doesn’t slip while you’re gutting a deer. 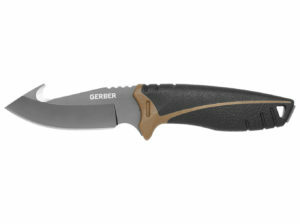 Gerber has designed the handle carefully so that it features a soft rubberized handle that has a very “grippy” feel. It is easy to control and handle while gutting so that you can still feel the strength of the full tang. The soft feel grip is one of the best features of this knife. The Myth Fixed Blade Pro features an innovative sheath. First, we’ll start by looking at the things that we like. Unlike a lot of sheaths, even though this knife comes with a hard-plastic sheath, it doesn’t have a cheap look by any means. It certainly looks good for the price. The sheath does a great job of doing its main task, and that’s making sure the knife sits comfortably and is held in place. The knife is a snug fit in the sheath, and the sheath has good protection so that the knife cannot slice through. In order to get the knife out, you have to pull to get it to release. Gerber has also built in a friction lock retention system to retain the knife, as well as a rubber restraint loop to keep the knife seated securely within the sheath. The stretch rubber retention strap helps to keep everything quiet as you go to draw the knife. Another innovative feature of the sheath is the built-in carbide sharpener. The sharpener is nothing more than average, which is a general expectation of a sheath sharpener. It can work to tough up the edges of the knife, or if you need a quick sharpen, however its use beyond that is extremely limited. While the sheath is overall very nice, a downside is that the belt spot could certainly be improved in the future. The belt loop is also relatively small, so that it can be problematic if you are a hunter who prefer putting your sheath on a wide belt. The joke with Gerber is that they use mystery steel. This knife uses 7Cr17MoV, full tang, high carbon stainless steel blade with titanium-nitride coating. While the steel is generally looked at as decent, it is a factor as to why this knife doesn’t hold an edge that great. As mentioned earlier, this knife has the feel as if it was designed by someone who has actually gutted a deer (which is nice!). For its size, this knife is surprisingly very lightweight. Even though it may be light, it still has a sturdy feel and proper weight balance making it an ideal size for field dressing big game. 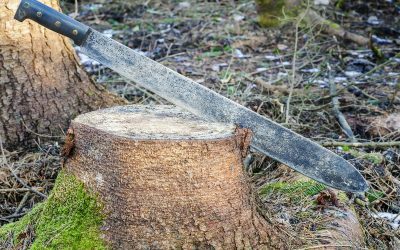 Looking at the knife, you will see that it’s covered by a rubberized handle, and full length tang that goes to the metal pommel. It also has several other nice features, such as a nice choil that you can use to choke up on the knife, as well as thumb depressions on both sides of the handles for your thumbs to sit. Those spots allow for better control while skinning game. Overall, Gerber doesn’t disappoint with this knife. It is a well-made, good value knife that lives up to the Gerber standard. While I would not recommend buying this knife with the intention of using it as a survival knife, it can serve for multi-purposes in a pinch. However, the real strength of this knife is with its gut hook and ideal size for field dressing deer. It’s a sturdy, durable hunting and gutting knife and excels in what it was designed for. When it first came out this knife was a bit pricey, however, over the years the price has come significantly down now making it a very good value buy. This knife has built up a strong reputation, and some even think this is the best Gerber knife that they own! 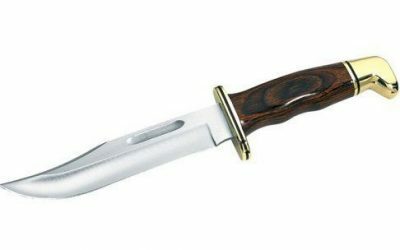 If you look up the definition of value in the dictionary, you might find a picture of this knife, Elk Ridge Hunting Knife (ER-300CA). For the money, this knife provides astounding value. 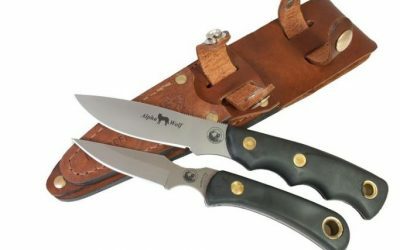 Not only does it come with a straight edge knife, a gut hook knife, and a sheath, but the reason that Elk Ridge is providing so much value is because of the quality of the set. At such a low price point, most people would expect these to be low-end, dull knives. Like most people who have tried this set, our expectations have been tremendously exceeded when you put into perspective what comes in this set. First and foremost, the most important feature for field dressing is having a sharp knife. Any hunter that has gutted game can attest that a dull knife is useless. Out of the box, these knives are razor sharp and ready for action. When skinning game, fine, precise cuts are required, and these knives allow for those laser-precise cuts (instead of long swipes). The knives are sharp enough that they can rip through a sternum, and they maintain a surprisingly good edge throughout gutting and skinning. They can easily slice through deer, elk, rabbit and other game like its butter. The sharpness of the knives make gutting and field dressing a quick process. 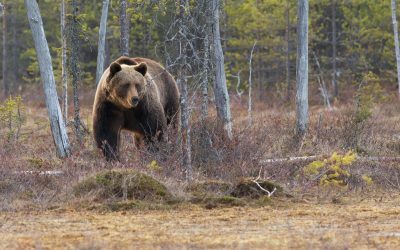 However, while they generally hold an edge well, they can still dull out after skinning several deer or thick hide, so having a sharpener handy is important. They feature non-slip texture material which allows for the handles to hold up well and prevents the knife from slipping out of your hands when things get wet. The gutting knife comes with a finger hole and thumb jimping on the back of the blade that allows for added control. It has a very sturdy feel to it, and full tang. The handle and knives are on the smaller side than some hunters expect, so it is worth noting that if you have larger hands, it might feel difficult to hold or get your finger through the hole. However, most find that it has a very comfortable, sturdy grip with strong integrity. Another downside worth mentioning about the design of these knives is that they have camo handles which can make them hard to find if you put down or drop. Not everything is fantastic about this set, and it is hard to expect as much at a price this low anyway. 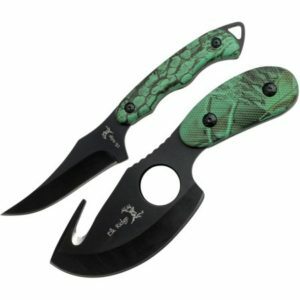 While the set comes with a black nylon dual carry sheath that can fit both knives, it is on the cheaper end. It can securely fit both knives, but the problem is in the quality of the material used for the sheath. These may be smaller hunting knives, but they are sleekly designed to rest comfortably in your hand. The knives have small handles, but as a result offer precise cuts. The gut hook knife has an extreme curvature for the belly which is great for slicing through game. The skeletonized handle helps you to maintain a firm grip even when there might be some blood on you. This is set truly is a great value buy. Not only do they come razor sharp out of the package, but they stay sharp, and slice easily through game. They are very well built, and give off a sturdy feel. Price is so low that first impressions give off that they must just be really cheap knives, but you’ll find the opposite. This is a perfect entry level knife set for a beginner hunter. For an experienced hunter, it can also be a beneficial set to add to the collection as a sharp skinning knife and gut hook can always come in handy especially if it doesn’t break the bank. Many reviewers have mentioned that they were so pleased with the set that they have ordered a second set! It is competitive with skinning knives double the price. 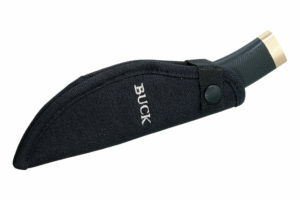 Buck Knives is known for their premium quality, and ‘Made in the USA’ brand. 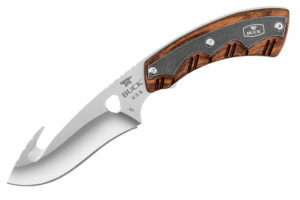 The Buck 0537RWG-B is a part of Buck’s Open Season Series. 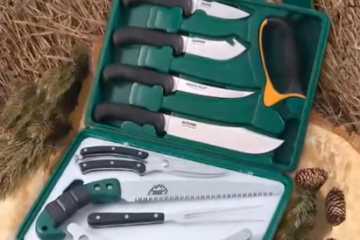 This is the skinning and gutting model in a series that is designed to serve for a variety of a hunter’s needs with a folder knife, small game knife, and boning and caping knife. Unlike the other knives on our list, this knife is most expensive, but for good reason. It offers more premium features, and is a more pristine knife than the others. While all of these knives are very good, this one has higher quality features, and it comes through in the price (however, still very reasonably priced – generally – at less than $100). As we’ve come to expect of the Buck Knives brand, this knife is not only expertly designed, but is very practical, functional and useful. It is obvious that a lot of attention was placed to the angles on the sharpened edge, shape, and size of the entry opening and location of the gut hook. Some knives simply throw the gut hook onto the knife just to add an extra feature, and in those instances it deters from the knife’s performance. On the Buck Knife 0537RWG-B, the gut hook is a prime feature, and is designed perfectly if you are someone who utilizes the gut hook for field dressing game. As far as the blade quality, this knife comes out of the box razor sharp. 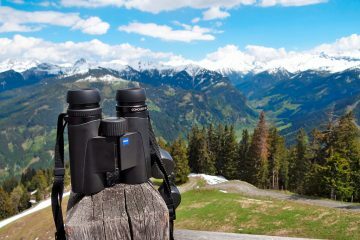 It is ideal for deer hunting, skinning and gutting. It can easily handle most game that you throw at it. What’s even better is that the edge on this knife can hold for a very long time. It’s a pain if a hunting knife needs continual sharpening especially as you are out in the field. The edge retention is one of the best features of this knife. Another premium feature of this knife is the S30V Steel, which is Buck Knive’s highest end steel. It truly is a top of the line steel blade, and it is a major reason that it has superb edge retention and high ductility. It is double tempered, ultra-tough steel that is corrosion resistant. The S30V Steel contains carbon, chromium, molybdenum and vanadium. For the money, you are paying extra for the quality of the blade and steel. This knife will stay sharper much longer than the other knives on this list. The steel is hardened to a 58 Rockwell hardness. The problem is that when the knife starts to lose its edge, it can be difficult to re-sharpen yourself unless you are experienced. It’s not a short term problem as it holds its edge for a while, but important to consider long term. The Buck Open Season Skinner knife comes with a genuine leather black sheath with belt loop. The belt loop doesn’t offer the tightest fit. 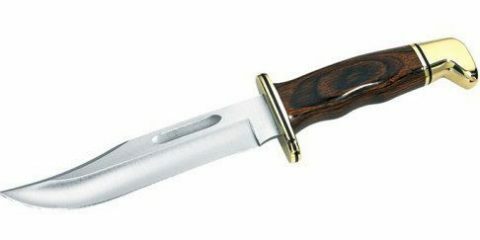 It is a typical Buck Knives sheath and of pretty high quality and material (being genuine leather). One issue is that the sheath can get caught in the way of the gut hook since it is not a pull up sheath. Equipped with a rosewood Dymondwood handle, this knife is certainly well balanced and comfortable to hold, but could have been better designed. Of all things, it is surprising that a knife of this quality doesn’t have a better handle as it is important to be able to maintain a grip through any type of bloody or wet condition. In our opinion, this is not only one of the best gut hook knifes available on the market, but a higher-end one at that. The gut hook was well designed and the blade functions well. 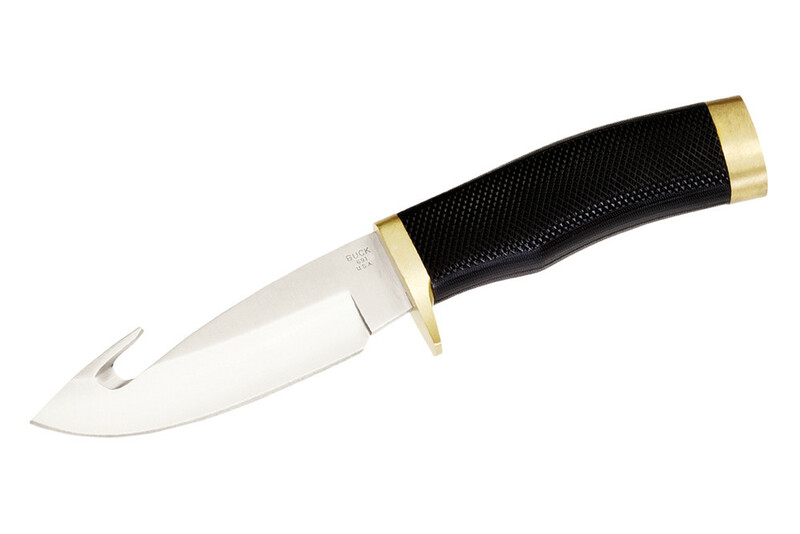 It is a handsome, stylish looking knife that packs a real punch with its razor sharp blade. The black leather sheath is serviceable. Overall, this is an ideal gut hook knife that should exceed your field dressing needs. If you’re a newer hunter, or you’re on a budget and looking for a cheap gut hook knife, then add the Mossberg Fixed Skinning Knife to your list. At 6.75 inches, it is certainly on the smaller side, but as we know, size doesn’t always matter. While it is small in stature, it doesn’t mean that it is an ineffective skinning knife. 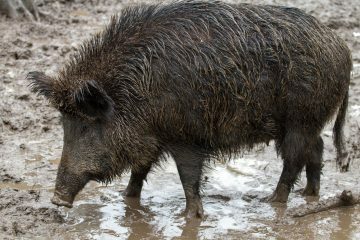 Its ideal function is to skin and gut small animals, but it is still strong enough to handle medium size game. Many users of the Mossberg Fixed Skinning Knife have mixed reviews and opinions on the sharpness of the blade. It comes moderately sharp from the factory, but for most hunters, it is recommended to sharpen it before taking it out to the field. It doesn’t take long to sharpen the blade, and it holds its edge relatively well. You might want to keep a sharpener handy with this knife in the field, or simply keep this knife as a back-up option to your main skinner. The gut hook also works well to open a animal without damaging internals, particularly for small game and deer. 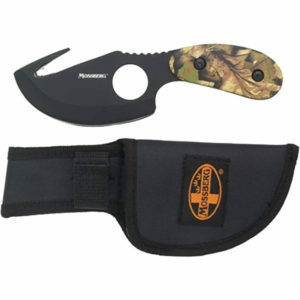 The blade is sharp and angled for easy use, and can handle tough hides. The knife is small enough that you can maneuver it with control to get into tight areas. From a design perspective, this model is light, but durable. If you have large hands then it might be harder to grip, but it does have a comfortable handle to it. Most people like that it’s a sleek, sturdy knife that has ergonomic features such as the hole and pebble grip on the handle that help with its grip in wet conditions. The one major let down with this knife is the sheath. 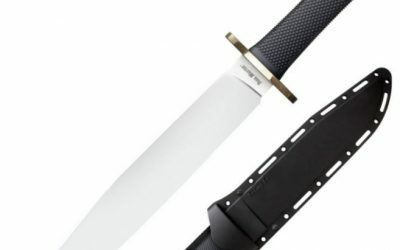 Most people are surprised that Mossberg had this manufactured in China, and while the quality of the knife is very good for the money, the sheath leaves a lot to be desired. The knife does not fit snug in the case, and when you put it away it cuts at the strap. The velcro on the case is also mediocre. The stitching on the sheath is not adequate for the blade of this knife. The sheath does not hold the knife securely to prevent the tip of the blade from being exposed (back edge slides a bit out of the sheath), so you need to be careful when carrying this knife. It’s a practical and durable gut hook knife, and a fantastic budget option. While it has limited functionality and should be reserved for field use specifically, it’s a nice, cheaper option to consider adding to your collection (generally it can be found for less than $20). If you want a compact gut hook knife and have reasonable expectations, then this is a nice deal for the money as a budget option. What is a Gut Hook Knife? If you’re not familiar with what a gut hook is, its essentially a special type of blade. The hook in the spine, closer to the point, has a small rounded and sharpened semi-circle which makes it ideal for field dressing. When gutting an animal, a hunter can place that hook into a small incision on the underside of an animal, and essentially pull it like a zipper to open the animal’s belly. The small hook works to split the skin and open the abdomen of the animal without slicing the muscle or effecting the meat. The gut hook pierces and slides beneath the skin to ‘unzip’ the animal without puncturing internal organs. Why a Gut Hook Knife? A gut hook knife is not for everyone. It truly depends on your needs, and what you do out in the field. The gut hook is ultimately designed to help prevent a hunter from cutting into the stomach and intestines of the animal, protecting the meat. A gut hook is not the only way to skin and gut game. Instead it’s a quality tool in your tool bag that can help quicken and simplify field dressing in comparison to a traditional hunting knife. Some hunters take comfort in knowing that the gut hook protects the guts from being punctured when gutting an animal. The gut hook enables some hunters to work better, faster, and safer when processing numerous animals. It is very useful in that it can help you save time, and even the meat of the animal. A gut hook can serve as another reliable tool in your bag to help you fly through the field dressing process. The gut hook takes some getting used to, but is a great tool once you have practice with it. Like with many things in life, there are two schools of thought about gut hooks: some who can’t field dress without it, and others who hate it. It really comes down to personal preference. Some hate it because they’ve encountered problems the first few times they’ve used it and it has tainted their experience with it. For hunters who haven’t used a gut hook before and have experience gutting and skinning without it, it can take some time to get used to it until they become more practiced with it, but it can make things much easier and quicker. Many find it to add convenience to field dressing. It will come down to personal preference. Like with any new skill, you need to stick with it to get used to the positioning of the blade if you have initial difficulty. However, by learning to use the gut hook, it is an extra tool that you can add to your tool-belt, available if you ever need it (and will be something that you want to use).